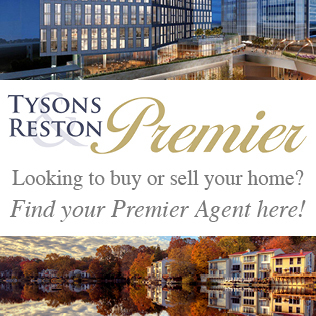 Founded in 1993, the Chrysalis has long been regarded as the remodeling industry’s most prestigious peer award. 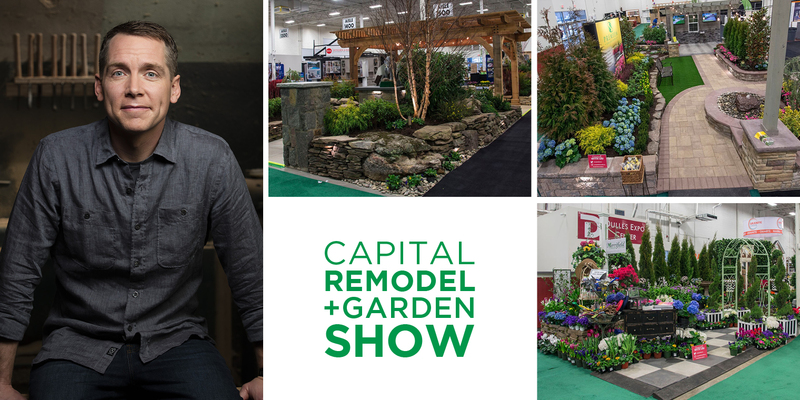 Qualified Remodeler Magazine and Kitchen and Bath News are among the national media sponsors. More tellingly, the two prizes were conferred in vastly different categories, an indication of the evolving range and relevance of the firm’s design team. On this point, a closer look at the two top-in-category winners reveals much about homeowner passions and prevailing trends. The recently-completed rear elevation to the Leesburg home of Chris and Amber Wooten perfectly integrates an architecturally-appropriate “built” solution with a spacious park-like surrounding that unfurls in over 1.5 acres. 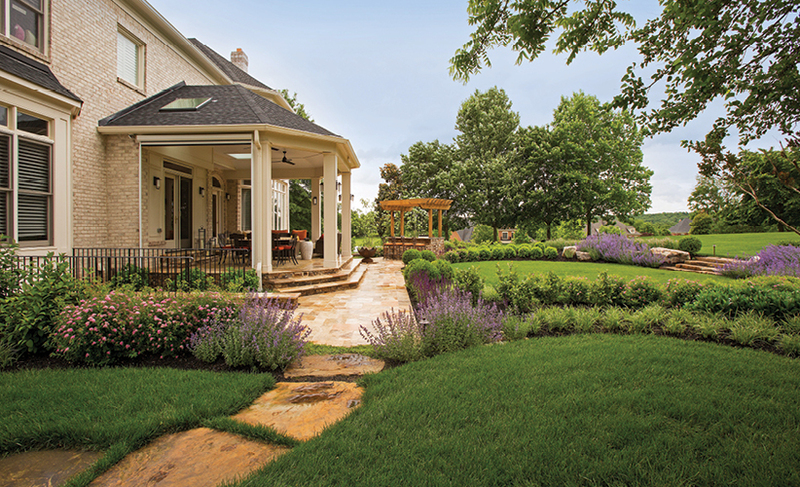 The addition’s crisply articulated architecture sets the tone for a varied landscaping scheme that explores formal patterns and design motifs, laying the foundation for a garden rife with lavender, wygelia, and other outdoor focal points. A key to the solution’s overall coherence begins with a conservatory-style conical roof that repeats the roof line on the home’s two-level bay. The symmetry lends balance where needed, permitting the somewhat playful landscape design to build visual rhythm. The kitchen’s bay window was, in turn, converted into a double slider accessed from the existing kitchen. An door that exits from the family room to the porch was preserved. “The new elevation perfectly establishes a logical indoor/outdoor continuum,” says Roger Lataille, Sun Design’s senior design consultant. With a 12-foot ceiling, and four support columns defining a semi-circular periphery, the porch is zoned for both outdoor dining and a separate conversation arena furnished with all-weather wicker furniture. The ceiling is fitted with two rotating fans, skylights and a hidden sound system. The effect of a covered platform supported by vertical posts is aesthetic: it presents the garden as a series of beautifully-framed compositions. 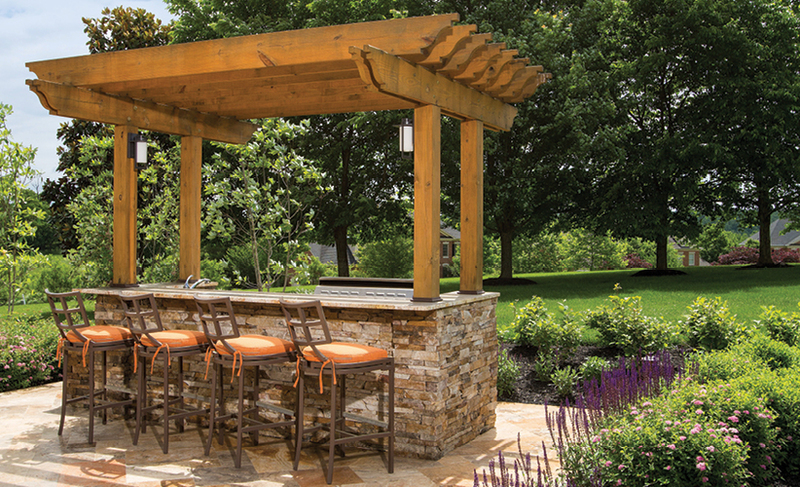 The “built” component that gives still further expression to this sensibility is the pergola-topped outdoor kitchen—which occupies a 19′ x 25′ extension of the limestone patio, yet is some 20 feet away from the porch. Equipped with a sink, a refrigerator and a gas-powered stove, the bar is an independent gathering zone that seats four and provides spot-on views of an expansive lawn and mature trees. The structure is clad in stacked stones; the pergola is constructed from pressure-treated pine. Meanwhile, the limestone in the patio is laid in a diagonal pattern, presenting a compelling textural contrast suitable for a mid-garden venue. With a fire pit mid-way between the kitchen and the porch, and a table in the midst of the wicker sectional that also function as a space heater, the porch provides a perfect gathering place from early spring to late fall. 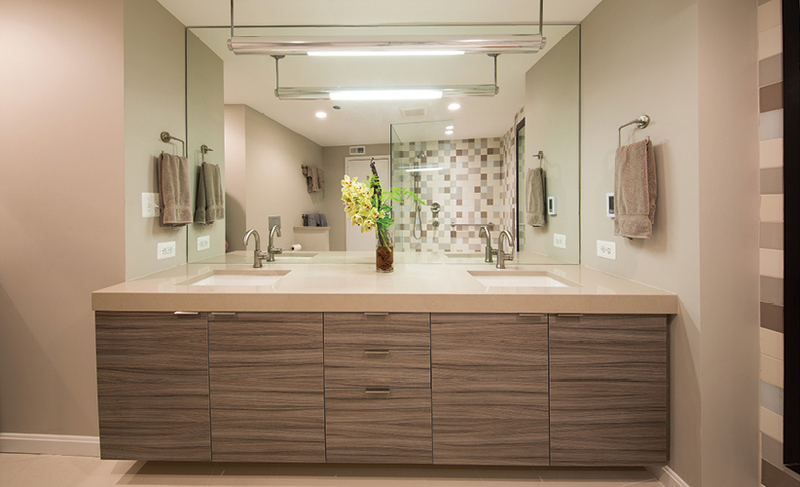 An artfully executed 1,800 square foot master bathroom maekover in a Crystal City condo was judged a category best (“bathrooms above $75,000”) for the entire southeastern US. Fundamentally, the owners were looking for a more functional space plan and help in exploring some style improvements,, but once Sun Design’s Katie Coram and Morgan Hutchinson entered the picture an inspired collaboration got underway in earnest. Beginning with a discussion on “style preferences” (the homeowners had stockpiled ideas for close to a year), Coram concentrated on creating a highly functional, visually effervescent elaboration in 220 square feet that could not be enlarged in any direction. A larger shower replaced an unused soaking tub. A wall-hung toilet (replacing the existing unit) allowed a wider swing radius for the bathroom door. But a still more innovative conceit addressed the owner’s interest in gaining a bathroom window. “The owners showed us a photo of a glass block wall, Coram recalls. “They wanted natural light in the room and liked the glass-block look. The window motif, in turn, inspired the glass mosaic tile that covers the shower floor—which further prompted a decision to elaborate wall elevations in five different ceramic tile designs. The changes make the room feel substantially larger, no easy feat when walls can’t be moved. An industrial shop light previously mounted over the vanity was re-deployed. 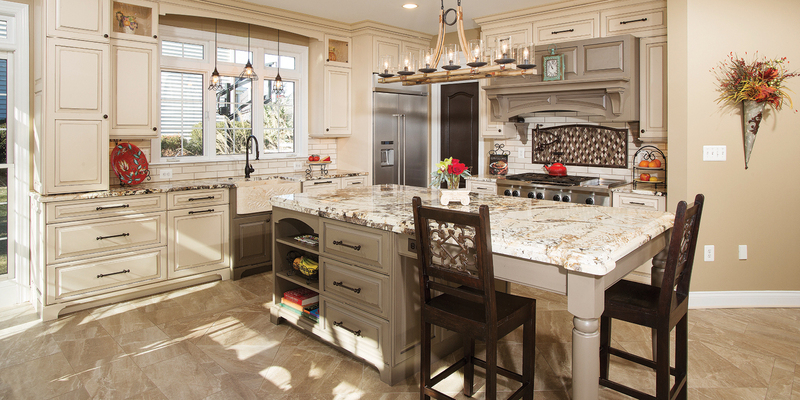 Meanwhile, the frameless textured cabinetry and quartz surfaces complement a lively, yet warmly ambient tone. Sun Design Remodeling frequently sponsors design and remodeling seminars as well as tours of recently remodeled homes. Headquartered in Burke, Sun Design also maintains an office in McLean, VA. For information visit www.SunDesignInc.com, or call 703-425-5588. Best exterior. 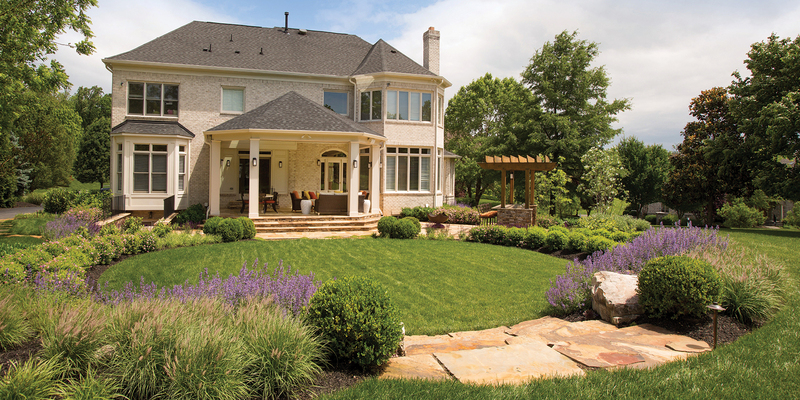 Sun Design Remodeling has garnered a Chyrsalis Award for the “best exterior” in the south Atlantic US. 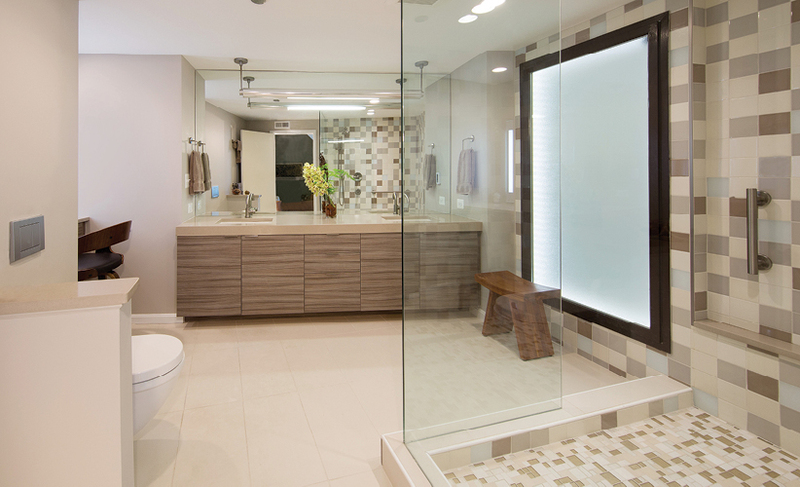 The prize is sponsored annually by Qualified Remodeler Magazine and Kitchen and Bath News. The remodeler developed a conservatory-style open air rear porch linked to a perogola-topped outdoor kitchen. 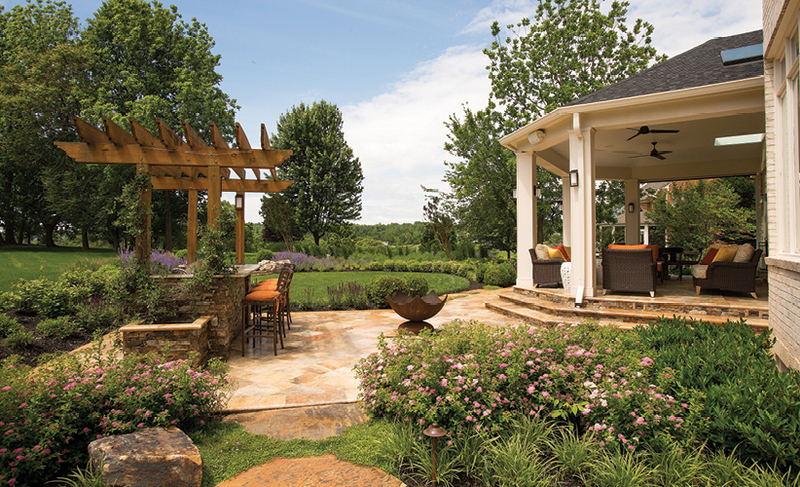 Rose- and tan- hued limestone gives definition to porch flooring, walkways and other unifying components that integrate with the English-style landscaping style. The porch’s conical roof is borrowed from the two-level bay on the right.